The Harrisburg School District is seeking out area businesses to add to its growing list of intern opportunities for HHS students. Career Launch is a program established under the leadership of Governor Dennis Daugaard to increase student awareness about career opportunities in their communities and help meet South Dakota’s demand for a skilled workforce. 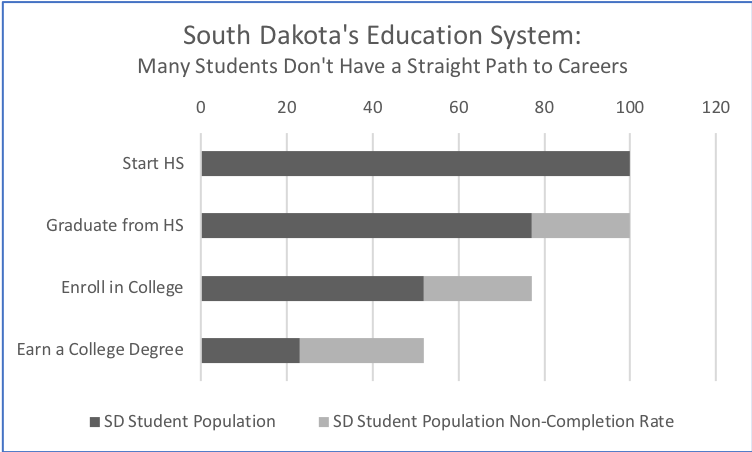 Although not reflective of the Harrisburg population, the above chart depicts a sample of 100 South Dakota public school students who entered high school in 2006. As may be seen, 77 graduated, with only 52 graduates entering a post-secondary school. Only 23 completed. Daugaard says: “We are encouraging high schools to expand the availability of work-based experiences, such as apprenticeships, internships or job shadowing during school. The best way for young people to learn about careers and find fields they like - or don’t like - is to experience them. There are two inter-related workforce problems in South Dakota. From the perspective of businesses and employers, our state does not have enough workers in many skilled fields, and this is a barrier to economic growth. We have companies that do not expand, or that turn away business, because they cannot hire enough skilled workers to do the work. Almost any business owner will identify workforce as a significant concern. But we must also see this from the perspective of our young people. We want them to receive an education that allows them to find well-paying, fulfilling jobs, here in South Dakota. We have an excellent education system in our state, but we must help all of our young people achieve this goal. Additionally, high school student engagement and youth participation in the workforce has declined dramatically over the past two decades. This reduced opportunities for students to gain exposure to a variety of occupations and develop foundational employment skills. This lack of work experience can lead students to make costly decisions about their futures lacking sufficient real-world context. Without this context, young adults may learn too late that their chosen pathway either is not a good fit or they still lack the skills employers need. If you are interested in providing opportunities for HHS students, please contact Travis Lape, Innovative Programs Director, at 605-743-2567 extension 3392.